The 95th anniversary of a prominent composer, People’s Artist of Azerbaijan Suleyman Alasgarov will be marked in Baku. The event will take place at the Heydar Aliyev Palace on February 19, Trend Life reported. The evening is co-organized by M?d?niyy?t TV. Theatrical performances from the works of Suleyman Alaskarov will be presented to the audience. The ticket price is 10-50 AZN ( $ 6-29). Tickets can be purchased at all city ticket offices, ASAN Service Centers, Ganjlik Mall and 28 Mall, as well as online at www.iticket.az. Suleyman Alasgarov was born on February 22, 1924 in Karabakh, the city of Shusha. 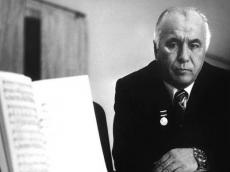 In 1948, he graduated the Azerbaijan State Conservatory with honors and became the director of the Baku Music School. From 1949 to 1951, he was an artistic director of the Azerbaijan Film Committee Orchestra. In 1951-1952, Suleyman Alasgarov headed the Song and Dance Ensemble of the Azerbaijan State Philharmonic Hall. Between 1954-1956, he worked as the head of the Department of Art at the Azerbaijani Ministry of Culture. From 1956 to 1958, he conducted the Azerbaijan State Orchestra of Folk Instruments. Since 1958, he was a teacher, and from 1968 - assistant professor of the Conservatory. In 1958-1960, Suleyman Alasgarov was an artistic director of the Republican Committee on Television and Radio Broadcasting. Then for 11 years, he worked as the director and principal conductor of the Theater of Musical Comedy named after Shikhali Gurbanov. Since 1970, he headed the educational and methodological council on musical and aesthetic education of the Ministry of Education of the Azerbaijan SSR. From 1991 to 2000, he was a rector of the Shusha branch of the Conservatory, created on his own initiative. The composer wrote two operas, twelve operettas, two symphonies, Bayati-Shiraz mugham, overtures for a symphony orchestra, two symphonic poems, six cantatas, works of various genres for choir and orchestra of folk instruments and about 200 songs and romances. He is also the author of a number of textbooks for secondary schools. Unfortunately, Alasgarov died on January 21, 2000.